MMA Joinery have won the contract to construct and erect the timber frame external kit to this school, along with the extensive larch cladding. 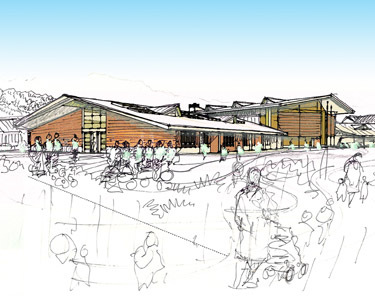 Contract awarded for £11.9 million Aviemore community primary school. The development of this community primary school is the first of its kind in the Highlands. The school has been designed to a high sustainability standard and is achieving a ‘very good’ rating using the Building Research Establishment Environmental Assessment Methodology (BREEAM). The school facilities will include 10 primary classrooms, 2 general purpose classrooms and a resources area; a main hall; wrap around nursery unit and childcare facilities (with independent access); assisted support needs facilities; multi-purpose sports hall; kitchen and dining facilities; support for learning unit; biomass boiler and a fenced sports pitch. It will also feature a range of community facilities including a community library, service point, sports changing facilities, multi purpose activity room, meeting room, learning centre and Service Point reception with interview rooms. The development has been designed in house by the Council’s Housing and Property Service on behalf of the Education, Culture and Sport Service as client sponsor. Project management services will also be provided ‘in house’.